Tom Brokaw is taking and promoting medical marijuana. The 79-year-old Emmy-winning newscaster, known for his straight-laced views, revealed on Tuesday that he turned to the drug to ease his pain from multiple myeloma, a type of blood cancer. Brokaw’s disease in currently under control, and cannabis, which is legal in his winter-home state of Florida, is providing some relief from the lingering pain in his bones. Speaking in a video for cancer site SurvivorNet, he said the drug is giving him back his quality of life. Marijuana isn’t the only lifestyle change he’s made: the revered anchor says he no longer drinks out of plastic water bottles after ‘a leading cancer researcher’ suggested they may be linked to cancer – a thriving myth that many scientists warn is an extrapolation. Brokaw was first diagnosed with cancer in 2013, nine years after he ended his 22-year run at NBC Nightly News. He has always been active – climbing, fishing and cycling – but he had battled orthopedic issues over the years. In the summer of 2013, his back was consistently painful. He went to his internist, and a blood test revealed cancer. Multiple myeloma is a cancer of the plasma, the white blood cells in bone marrow, diagnosed in about 30,000 Americans a year. Treatments can alleviate pain but it is not curable. The average life expectancy is around five years, though some live another 10 or 12 years. After receiving his diagnosis from the Mayo Clinic, Brokaw flew back to his family’s summer home, a remote ranch in Montana, to tell his wife, Meredith, in person after pouring a long drink. Twenty-four hours later he was in ‘excruciating pain’ and had to be medevacked back to the Mayo Clinic in Minnesota. He concedes that ‘99.9 percent of people’ in his situation would not be as fortunate to have such immediate and top-quality help. 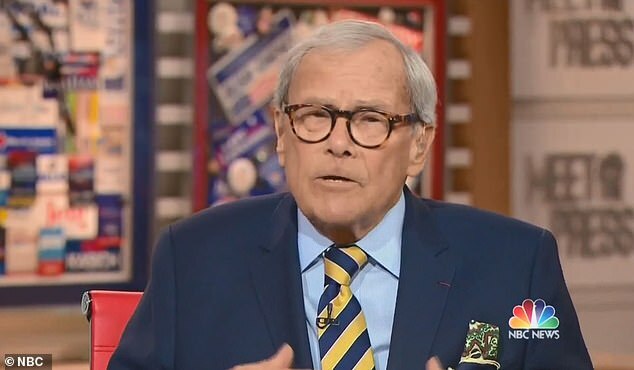 When he was diagnosed, Brokaw said, ‘I didn’t know what the hell they were talking about – proteins, bone invasion, a hole in your hip. Brokaw takes Revlimid, a chemotherapy drug, ‘full time,’ in a bid to kill his myeloma cells. At the moment, his cancer is in the ‘maintenance phase’, lowering the doses of Revlimid to reboot his immune system to be on high alert for cancer. The pain is often excruciating, and it can interfere with his ability to spend quality time with his family, which pushed him to find some relief from cannabis. As an over-65, he is hardly alone. Medical marijuana is now legal in more than half of US states, an according to a recent nationwide survey, over-65s are the fastest growing group of users. Dispensaries routinely report average customer age ranges starting from around 60. From marijuana to chemo to drug pricing, Brokaw’s diagnosis has thrown him into burrowing for answers in the murky world of cancer. He says it has given him a new appreciation for how fortunate he is to be high-profile with good health insurance and access to the best in the field, and his instincts as a journalist to question everything have proved invaluable. The most impenetrable question is: why did I get this in the first place? There is no way of knowing, but Brokaw puts forward a theory that breast cancer survivor Sheryl Crow aired in 2007: that water bottles could be linked to cancer. Brokaw said he asked ‘a leading cancer researcher’: ‘How come, John, we’ve not been able to get a grip on this and we’re out hunting? ‘That was a revelation to me quite honestly. I don’t drink out of them anymore.